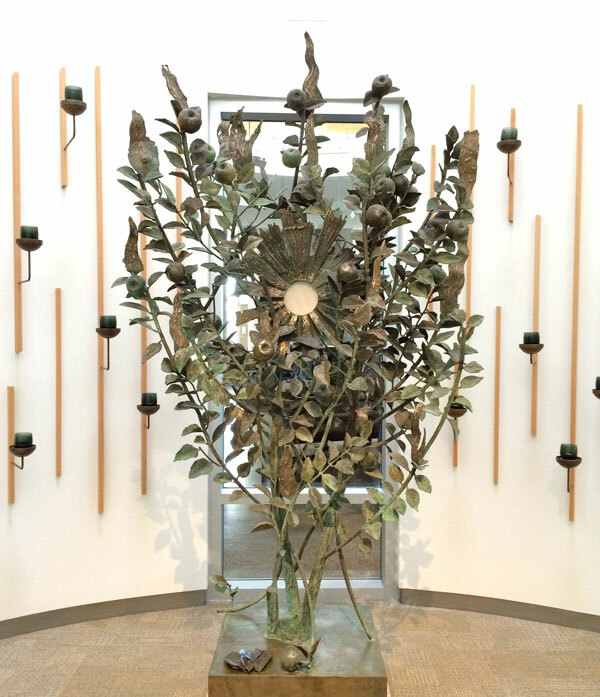 At the centre of the Perpetual Adoration Chapel of the Divine Mercy is the bronze sculpture of the Burning Bush. The work of American artist John Collier, the sculpture holds at its centre, the tabernacle designed for continuous exposition of the Blessed Sacrament. The bush is depicted with apples, which from the time of Saint Jerome, have been a symbol of temptation that is experienced as one grows closer to God. As Moses no doubt, experienced the temptation of doubt and fear when approaching God’s presence in the burning bush, we likewise experience much temptation when God is calling us to a deeper and more profound experience of him.